Retractable belt barriers are used to help control the movement and flow of people, particularly high volumes of people. This simple way of controlling the traffic of people in or out of an area is easy to set up. It is highly mobile and can easily be moved to where it is needed. These retractable belts are available with several different options of text such as “Authorised Access Only” or “Danger Keep Out.” They help prevent disorder by guiding people towards where they need to go. Where can the Retractable Belt Barriers Be Used? Retractable belt barriers are perfect for any occasion where the movement of pedestrians has to be controlled. They are perfect for use at grand openings, parties, concerts and other events. They are particularly helpful at blocking off dangerous areas and are a fantastic solution to any pedestrian traffic problem. 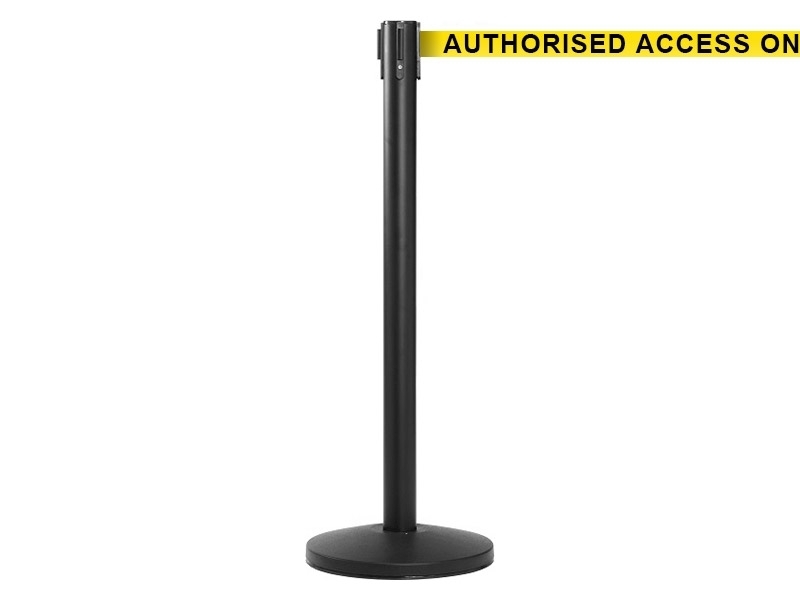 Retractable belt barriers are extremely versatile and may be used by anyone who would like to effectively contain movement of pedestrians, particularly in a busy location. They may also be used by anyone who would like to guide the flow of people in the right direction, as well as by anyone who would like to prevent harm by warning pedestrians about dangerous areas. These retractable belt barriers are available in black/yellow chevron belt, red/white chevron belt as well as red and yellow belts with messages. They come equipped with a belt lock to prevent accidental release. For your convenience, retractable belt barriers have a concrete filled galvanised steel base for better stability. The belts are 50mm wide and 3.4m long. Please contact our experienced sales team on 0800 0126777 if you require a bespoke design.